Fairfax Hall - Fairfax Hall, Waynesboro, Va. Professor John Noble Maxwell of Lewisburg, W.Va., founded Fairfax Hall in 1920. Maxwell formed a company to operate the school and capitalized it at $100,000 that, according to a newspaper article of the day, “…would indicate that it is the purpose of the company to conduct it (the school) on a liberal scale.” It operated as an exclusive finishing school for young ladies. W.B. Gates purchased it from the Maxwell family in 1936. Gates had been president of Blackstone College for 10 years. The school, including all grounds, and the Maxwell home, were valued at $275,000. It was run by the Gates and Nash families and enjoyed much success for many years. A gymnasium, designed by the Collins firm of Staunton, was built in the 1920s and included a swimming pool on the lower level. The Science Building, a brick structure, was built in the late 40s with a later addition. 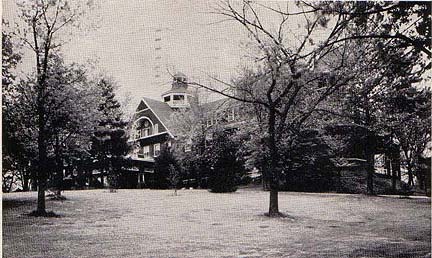 The school was complete with more than 60 acres, stables, riding ring and a number of faculty houses and dependent buildings. Many Fairfax Hall Alumni have yearbooks and the Waynesboro Public Library has much information about Fairfax Hall as a girls’ school. Fairfax Hall was closed in 1975 due to social changes in the country. During the same period, Augusta Military Academy and Staunton Military Academy were also closed. Stuart Hall and Fishburne Military School have survived and are now thriving.